The crude oil market ($CL_F) has been rather volatile lately, with the past few weeks showing signs of strength in the overall economy. The stock indices have pushed into higher price areas pulling crude right along with them. It’s nice to see some of the commodities coming out of the “dog house”, after having been beaten up for most of the year. However, at Hawkeye we like to take a step back and look at the bigger picture because sometimes you can be so close to the action (the trees) that you can’t recognize where you are (the forest). And looking at volume is the EDGE that brings clarity back into the picture. 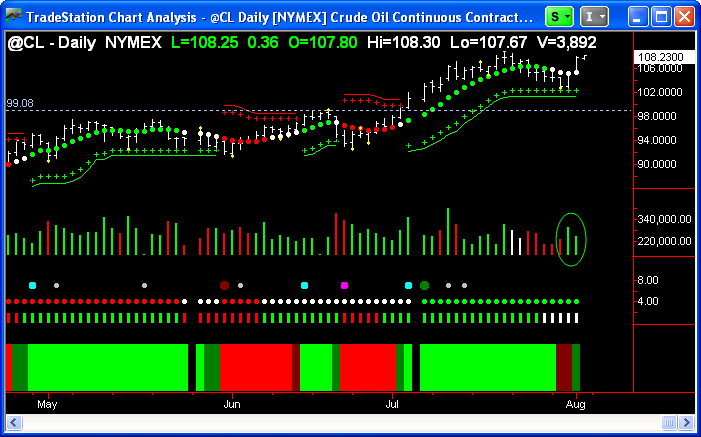 Let’s look at the Monthly Crude Oil chart, highlighted by Hawkeye Indicators. 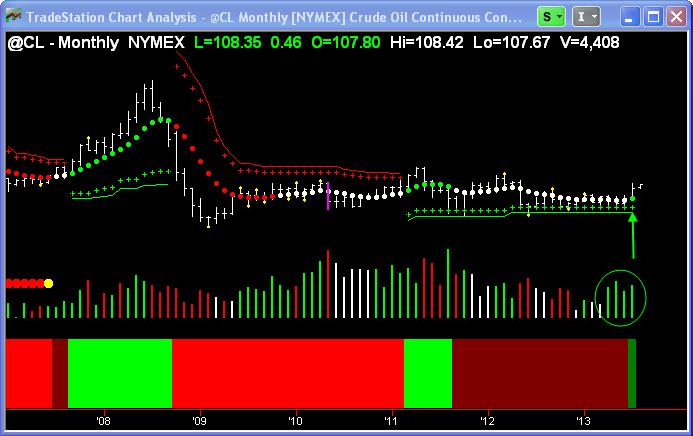 Crude Oil ($CL_F) Monthly chart showing an initial green trend dot change. Take a look at the CL Monthly chart above… it is the first time we have a green trend signal in almost two years. Notice the trend of buying volume coming into the end of this rather lengthy consolidation area (white trend dots). The level of volume on the last four months has consistently been higher than the volume in any other month during 2013… a good indication that buying volume is building and accumulation is taking place. Now, let’s take a look at the Weekly CL chart. 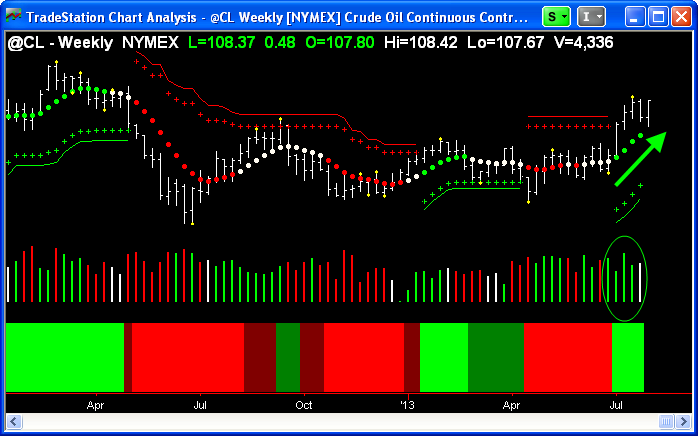 Weekly Crude Oil ($CL_F) chart. Again, we see a nice bullish trend building (green trend dots), supported by buying volume (green volume bars). The Heatmap (bright green area below volume) is bright green too, indicating momentum has become strong. And finally, let’s look at the daily chart. Crude Oil ($CL_F) daily chart. The bullish trend that started early July 2013 (shown by the green trend dots) on the daily has slightly corrected, but is showing signs of renewal. The Trend dot will change from white to green, indicating a resumption of the long trend shown in both the Monthly and Weekly charts. This will generate a Roadkill signal and should be enough to turn both the longer-term (weekly) volume green and the daily Heatmap from dark green to bright green. With the overall commodity markets in “major correction” mode, it’s important to keep watch on the ones that show us that strength is coming back into play. By looking at the Hawkeye Volume, the only leading indicator of price action and market sentiment, we clearly see bullish sentiment returning to the crude oil market. Taking advantage of harmony in the charts when all three timeframes agree is very rewarding.